From the ridiculous to the sublime, 8 days in the history of Everton Football Club. Resounding defeat against lowly Wigan followed a week later, with outstanding victory over the Champions of England. Last week the players, management and board of directors felt the full wrath of the Evertonians and the National Press. This lead to a siege mentality within the club, with no one breaking rank and speaking publicly about the FA Cup exit, until the manager and captain spoke in the clubs matchday programme. But rather than harm the club, as suggested by one local paper on Friday, the playing staff responding in the perfect way. On the pitch they were simply outstanding. They worked harder the champions, outskilled the champions and where is mattered most, out scored the champions by two goals to nil. It is slightly unfair to single out individuals in what was a brilliant collective performance, but it was fitting that a number of players who have received over the top criticism in the past, rose above the parapet, to fire Everton to a deserved victory. Seamus Coleman certainly came of age as a defender. As per the norm, exciting going forward, the Irishman caused havoc on the Everton right, giving Kolarov a proper seeing too. But at the back, he is developing into an accomplished defender. His diving header to deny Tevez a clear header in the dying minutes of the game was simply outstanding. Jan Mucha, who has lived in the shadow of Tim Howard since arriving at the club, has taken his opportunity brilliantly. Twice on Saturday, he kept Everton in the lead, with lightening reflexes and brave blocks with his body. 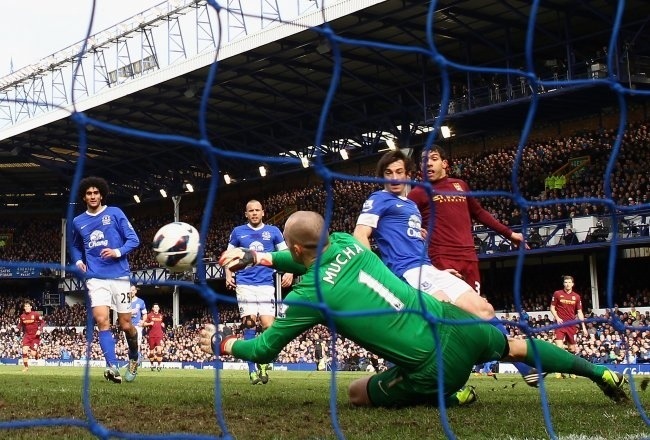 Tim Howard has served Everton brilliantly, but Mucha’s speed off the line had a significant bearing on this victory. Victor Anichebe, often much maligned, chased and at times won impossible causes. He was unlucky that a header midway through the second-half drifted just wide after brilliant and selfless hard work had won Everton the ball back deep in the City half. He ran himself into the ground and is likely to enjoy a prolonged run in the side with Fellaini and Pienaar set to endure 2 match bans for their disciplinary misdemeanors. And so onto the goals. Everton took the lead just after the half hour mark. Seamus Coleman had, by this point, scared the City defence into constant retreat and another break down the right hand side proved decisive. Coleman cut inside before laying the ball back to an on rushing Osman to fire home from 25 yards. Joe Hart in the City goal, could only stand and watch, as the ball swerved away from the England goalkeeper and into the top corner of the net. Everton’s second came deep into the second half. With injury time almost at an end, Everton broke away, after a superb and fair tackle from Naismith directed the ball into the path of Fellaini. Everton had a 2 on 1 breakaway, and Fellaini chose the perfect moment to play the pass to Jelavic, who cut inside, before firing a deflected shot over Hart to secure the victory. The game consisted of much more, with the referee and his officials having a torrid afternoon. A wrongly disallowed goal (Mirallas), two missed penalty shouts, both for and against Fellaini and a series of poor and rash decisions leading to a flurry of yellow cards. Pienaar was correctly sent off on the hour mark, but if the referee and grabbed a better hold on the game earlier in the encounter, it was highly likely that both teams would have finished this contest with 11 players on the pitch. It is Stoke up next after the international break, as Everton continue to rebuild a season that only a week earlier looked to be terminal decline.